Khyber Pakhtunkhwa (Pashto: خیبر پښتونخوا‎ ; ), (KPK) formerly called North-West Frontier Province, is one of the four provinces of Pakistan. It borders the (FATA) Federally Administered Tribal Areas to the west and south, Gilgit–Baltistan to the north-east, Azad Kashmir to the east, Punjab and the Islamabad Capital Territory to the south-east, and Afghanistan to the north-west. The province of Balochistan is located southwards. The provincial capital and largest city is Peshawar. Before independence from Britain, the North-West Frontier Province voted to join Pakistan in a referendum held on 2 July 1947; 50.1% of the registered voters(only 15% less than that in 1946 elections) exercised their vote and majority (99.02%) of them voted for Pakistan. There was no option in the polls to vote to become a sovereign state independent of India and Pakistan. Khan Abdul Ghaffar Khan and his Khudai Khidmatgars boycotted the polls with other nationalistic or pro-India Pashtuns. Some have argued that a segment of the population was barred from voting. Afghanistan claims the Pashtun dominated western areas of the territory as its own. After the independence of Pakistan in 1947, Afghanistan was the only country to vote against Pakistan’s accession to the United Nations, because of Kabul’s claim on the Pashtun territories on the Pakistani side of the Durand Line. The population of this region as per the 1901 Census of the North West Frontier Province was 2,125,480, out of which Muslims were 1,957,777, Hindus were 134,252 and Sikhs were 28,091. Afghanistan's Loya Jirga of 1949 declared the Durand Line invalid, which led to border tensions with Pakistan. Afghani governments have periodically refused to recognize Pakistan's inheritance of British treaties regarding the region. During the 1950s, Afghanistan supported the secessionist Pushtunistan Movement that failed to gain substantial support amongst the tribes of the North-West Frontier Province. Afghanistan's refusal to recognize the Durrand Line and its subsequent support for the Pashtunistan Movement has been cited as the main cause of tensions between the two countries that have existed since Pakistan's independence. After Ayub Khan eliminated Pakistan's provinces, Yahya Khan, in 1969, abolished this "one unit" scheme and added Princely States of Amb, Swat, Dir and, Chitral to the new North-West Frontier Province as the Provincially Administered Tribal Areas. During the Soviet occupation of Afghanistan (1979–1989), the North-West Frontier Province served as a major supply base for the Mujahideen who fought the Soviets during the 1980s. Following the arrival of Soviet forces, over five million Afghan refugees poured into Pakistan, most residing in the North-West Frontier Province (as of 2007, nearly 3 million remained). The province remained heavily influenced by events in Afghanistan. Civil war in Afghanistan (1989–1992) led to the rise of the Taliban, which had emerged in the border region between Afghanistan, Baluchistan, PATA and FATA as a formidable political force. Following the September 11 attacks in the United States in 2001, the FATA and bordering North-West Frontier Province became a front-line region again, as part of the global "War on Terror". In 2010 the name of the province was changed to "Khyber Pakhtunkhwa". Protests arose among the local Hindkowan, Chitrali, Kohistani and Kalash populations over the name change, as they began to demand their own provinces. Seven people were killed and 100 injured in protests on 11 April 2011. The Awami National Party sought to rename the province "Pakhtunkhwa", which translates to "Land of Pakhtuns" in the Pashto language. This was opposed by some of the non-Pashtuns, and especially by parties such as the Pakistan Muslim League-N (PML-N) and Muttahida Majlis-e-Amal (MMA). The PML-N derives its support in the province from primarily non-Pashtun Hazara regions. Khyber Pakhtunkhwa sits primarily on the Iranian plateau and comprises the junction where the slopes of the Hindu Kush mountains on the Eurasian plate give way to the Indus-watered hills approaching South Asia. This situation has led to seismic activity in the past. The famous Khyber Pass links the province to Afghanistan, while the Kohalla Bridge in Circle Bakote Abbottabad is a major crossing point over the Jhelum River in the east. A village view in Lower Dir. Geographically the province could be divided into two zones: the northern one extending from the ranges of the Hindu Kush to the borders of Peshawar basin and the southern one extending from Peshawar to the Derajat basin. The northern zone is cold and snowy in winters with heavy rainfall and pleasant summers with the exception of Peshawar basin, which is hot in summer and cold in winter. It has moderate rainfall. 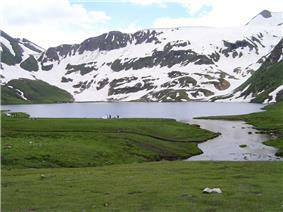 The southern zone is arid with hot summers and relatively cold winters and scanty rainfall. The major rivers that criss-cross the province are the Kabul, Swat, Chitral, Kunar, Siran, Panjkora, Bara, Kurram, Dor, Haroo, Gomal and Zhob. 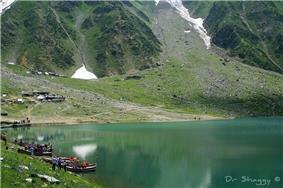 Its snow-capped peaks and lush green valleys of unusual beauty have enormous potential for tourism. The climate of Khyber Pakhtunkhwa varies immensely for a region of its size, encompassing most of the many climate types found in Pakistan. The province stretching southwards from the Baroghil Pass in the Hindu Kush covers almost six degrees of latitude; it is mainly a mountainous region. Dera Ismail Khan is one of the hottest places in South Asia while in the mountains to the north the weather is temperate in the summer and intensely cold in the winter. The air is generally very dry; consequently, the daily and annual range of temperature is quite large. Rainfall also varies widely. Although large parts of Khyber Pakhtunkhwa are typically dry, the province also contains the wettest parts of Pakistan in its eastern fringe. Chitral District lies completely sheltered from the monsoon that controls the weather in eastern Pakistan, owing to its relatively westerly location and the shielding effect of the Nanga Parbat massif. In many ways Chitral District has more in common regarding climate with Central Asia than South Asia. The winters are generally cold even in the valleys, and heavy snow during the winter blocks passes and isolates the region. In the valleys, however, summers can be hotter than on the windward side of the mountains due to lower cloud cover: Chitral can reach 40 °C (104 °F) frequently during this period. However, the humidity is extremely low during these hot spells and, as a result the summer climate is less torrid than in the rest of the Indian subcontinent. Most precipitation falls as thunderstorms or snow during winter and spring, so that the climate at the lowest elevations is classed as Mediterranean (Csa), continental Mediterranean (Dsa) or semi-arid (BSk). Summers are extremely dry in the north of Chitral district and receive only a little rain in the south around Drosh. At elevations above 5,000 metres (16,400 ft), as much as a third of the snow which feeds the large Karakoram and Hindukush glaciers comes from the monsoon since these elevations are too high to be shielded from its moisture. On the southern flanks of Nanga Parbat and in Upper and Lower Dir Districts, rainfall is much heavier than further north because moist winds from the Arabian Sea are able to penetrate the region. When they collide with the mountain slopes, winter depressions provide heavy precipitation. The monsoon, although short, is generally powerful. 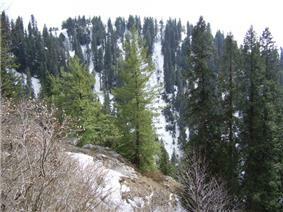 As a result, the southern slopes of Khyber Pakhtunkhwa are the wettest part of Pakistan. Annual rainfall ranges from around 500 millimetres (20 in) in the most sheltered areas to as much as 1,750 millimetres (69 in) in parts of Abbottabad and Mansehra Districts. This region’s climate is classed at lower elevations as humid subtropical (Cfa in the west; Cwa in the east); whilst at higher elevations with a southerly aspect it becomes classed as humid continental (Dfb). However, accurate data for altitudes above 2,000 metres (6,560 ft) are practically nonexistent here, in Chitral, or in the south of the province. The seasonality of rainfall in central Khyber Pakhtunkhwa shows very marked gradients from east to west. At Dir, March remains the wettest month due to frequent frontal cloud-bands, whereas in Hazara more than half the rainfall comes from the monsoon. This creates a unique situation characterized by a bimodal rainfall regime, which extends into the southern part of the province described below. Since cold air from the Siberian High loses its chilling capacity upon crossing the vast Karakoram and Himalaya ranges, winters in central Khyber Pakhtunkhwa are somewhat milder than in Chitral. Snow remains very frequent at high altitudes but rarely lasts long on the ground in the major towns and agricultural valleys. Outside of winter, temperatures in central Khyber Pakhtunkhwa are not so hot as in Chitral. Significantly higher humidity when the monsoon is active means that heat discomfort can be greater. However, even during the most humid periods the high altitudes typically allow for some relief from the heat overnight. As one moves further away from the foothills of the Himalaya and Karakoram ranges, the climate changes from the humid subtropical climate of the foothills to the typically arid climate of Sindh, Balochistan and southern Punjab. As in central Pakhtunkhwa, the seasonality of precipitation shows a very sharp gradient from west to east, but the whole region very rarely receives significant monsoon rainfall. Even at high elevations annual rainfall is less than 400 millimetres (16 in) and in some places as little as 200 millimetres (8 in). Temperatures in southern Pakhtunkhwa are extremely hot: Dera Ismail Khan in the southernmost district of the province is known as one of the hottest places in the world with temperatures known to have reached 50 °C (122 °F). In the cooler months, nights can be cold and frosts remain frequent; snow is very rare, and daytime temperatures remain comfortably warm with abundant sunshine. Abbottabad District 01984-01-01-00001984 3,122 Koklass pheasant, Kalij pheasant, Chukar partridge, Yellow-throated marten, Common leopard, Rhesus macaque, Flying squirrel. The province has an estimated population of about 21 million. The largest ethnic group is the Pashtun, who historically have been living in the areas for centuries. Around 1.5 million Afghan refugees also remain in the province, the majority of whom are Pashtuns followed by Tajiks, Hazaras, and other smaller groups. Despite having lived in the province for over two decades, they are registered as citizens of Afghanistan. According to the 1998 census, the population of the province was approximately 17 million, of whom 52% are males and 48% are females. The density of population is 187 per km² and the intercensal change of population is of about 30%. In most rural areas of the centre and south, Pashtun tribes can be found including the Gigyani (Their main land is Shabqadar Doaaba), Yusufzai, Bangash, Bhittani, Daavi, Khattak, Qazi khail also known as Qaziye Babar, Gandapur, Gharghasht, Marwat, Afridi, Shinwari, Orakzai, Mahsud, Mohmand, Wazir and Bannuchi as well as other tribes of Hazara division•, Swati, Kakar, Tareen, Jadoon, Tanoli, Gujar, Maliar, and Mashwani. There are non-Pashtun tribes including Arain Maliar, Jat, Mughal, Turks, Karlal, Rajpoot, Dhund Abbasi, Syed, Awan, Kashmiri, Qureshi and Sarrara. The mountainous extreme north includes the Chitral and Kohistan districts that are home to diverse Dardic ethnic groups such as the Khowar, Kohistani, Shina, Torwali, Kalasha and Kalami. However in the southernmost district such as Dera Ismail Khan live some of the Baloch tribe: Kori, Buzdar, Kanera, Leghari, Rind and some other sub tribes of Lashari tribe. These Baloch tribes speak Saraiki as their first language. In this southern district, most of its population speaks Saraiki. Urdu, the lingua franca being National language is also spoken and understood. Pakhto, is the major language, spoken and understood mainly in the central districts. Hindko, (a Punjabi dialect) is in Majority in Hazara Division and also in the central old city areas of Nowshera, Kohat and Peshawar cities. Standard Punjabi, minority living in the major cities and all cantonment areas. Kohistani, majority in Kohistan district and north half of Swat district. Gojri minority throughout Northern half of the province. Other languages include, Kashmiri, Shina, Romani, Burushaski, Wakhi, Balti, Balochi, Brahui, Sindhi and English (official and used in tourism). Only Urdu and English are found as written languages in the city. English, the official language of Pakistan, is mainly used for official and literary purposes. Most of the inhabitants of Khyber Pakhtunkhwa profess Islam, with a Sunni majority and significant minorities of Shias, Ismailis, and Ahmadis. Many of the Kalasha of Southern Chitral still retain their ancient Animist/Shamanist religion. There are very small communities of Hindus and Sikhs. District map of Pakhtunkhwa and Federally Administered Tribal Areas. The Provincial Assembly of Khyber Pakhtunkhwa consists of a 124-member Assembly. Members serve five-year. 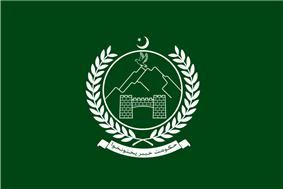 The Khyber Pakhtunkhwa executive branch]] consists of the Governor of Khyber Pakhtunkhwa appointed by President of Pakistan (subject to Prime Minister advice), Chief Minister of Khyber Pakhtunkhwa elected by Provincial Assembly of Khyber Pakhtunkhwa and Cabinet of Khyber Pakhtunkhwa appointed by Governor of Khyber Pakhtunkhwa (subject to Chief Minister advice). The High Court and lower courts, judges are appointed by Chief Justice of Pakistan with Supreme Judicial Council of Pakistan approval, interpret laws and overturn those they find unconstitutional. Khyber Pakhtunkhwa consists of 26 districts, comprising 21 Settled Area Districts and 5 Provincially Administered Tribal Area (PATA) Districts. The administration of the PATA districts is vested in the President of Pakistan and the Governor of Khyber Pakhtunkhwa, by Articles 246 and 247 of the Constitution of Pakistan. Peshawar is the capital and largest city of Khyber Pakhtunkhwa. The city is the most populous and comprises more than one-eighth of the province's population. Khyber Pakhtunkhwa has the third largest provincial economy in Pakistan. Khyber Pakhtunkhwa's share of Pakistan's GDP has historically comprised 10.5%, although the province accounts for 11.9% of Pakistan's total population. 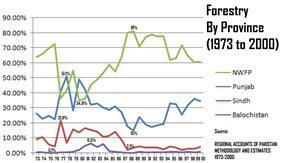 The part of the economy that Khyber Pakhtunkhwa dominates is forestry, where its share has historically ranged from a low of 34.9% to a high of 81%, giving an average of 61.56%. Currently, Khyber Pakhtunkhwa accounts for 10% of Pakistan's GDP, 20% of Pakistan's mining output and, since 1972, it has seen its economy grow in size by 3.6 times. It has the second poorest economy after Balochistan. After suffering for decades due to the fallout of the Soviet invasion of Afghanistan, today they are again being targeted for a different situation of terrorism. Agriculture remains important and the main cash crops include wheat, maize, tobacco (in Swabi), rice, sugar beets, as well as fruits are grown in the province. Some manufacturing and high tech investments in Peshawar has helped improve job prospects for many locals, while trade in the province involves nearly every product. The bazaars in the province are renowned throughout Pakistan. Unemployment has been reduced due to establishment of industrial zones. Workshops throughout the province support the manufacture of small arms and weapons. The province accounts for at least 78% of the marble production in Pakistan. The Awami National Party sought to rename the province "Pakhtunkhwa", which translates to "Land of Pakhtuns" in the Pashto language. This was opposed by some of the non-Pashtuns, and especially by parties such as the Pakistan Muslim League-N (PML-N) and Muttahida Majlis-e-Amal (MMA). The PML-N derives its support in the province from primarily non-Pashtun Hazara regions. In 2010 the announcement that the province would have a new name led to a wave of protests in the Hazara region. On 15 April 2010 Pakistan's senate officially named the province "Khyber Pakhtunkhwa" with 80 senators in favor and 12 opposed. The MMA, who until the elections of 2008 had a majority in the Khyber Pakhtunkhwa government, had proposed "Afghania" as a compromise name. After the 2008 general election, the Awami National Party formed a coalition provincial government with the Pakistan Peoples Party. The Awami National Party has its strongholds in the Pashtun areas of Pakistan, particularly in the Peshawar valley, while Karachi in Sindh has one of the largest Pashtun populations in the world — around 7 million by some estimates. In the 2008 election the ANP won two Sindh assembly seats in Karachi. The Awami National Party has been instrumental in fighting the Taliban. In the 2013 general election Pakistan Tehreek-e-Insaf won a majority in the provincial assembly and has now formed their government in coalition with Jamaat-e-Islami Pakistan. Hindko and Pashto folk music are popular in Pakhtunkhwa and has a rich tradition going back hundreds of years. The main instruments are the rubab, mangey and harmonium. Khowar folk music is popular in Chitral and northern Swat. The tunes of Khowar music are very different from those of Pashto and the main instrument is the Chitrali sitar. A form of band music composed of clarinets (surnai) and drums is popular in Chitral. It is played at polo matches and dances. The same form of band music is played in the neighbouring Northern Areas. 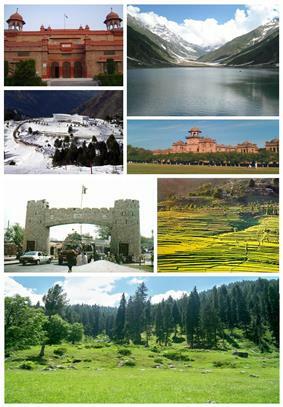 Abbottabad is the only city in Khyber Pakhtunkhwa with higher literacy rate in province and also in Pakistan.The trend towards higher education is rapidly increasing in the province and the Pakhtunkhwa is home to Pakistan's foremost engineering university (Ghulam Ishaq Khan Institute of Engineering Sciences and Technology), which is in Topi, a town in Swabi district. The University of Peshawar is also a notable institution of higher learning. The Frontier Post is perhaps the province's best-known newspaper and addresses many of the issues facing the population. Karnal Sher Khan Cadet College Swabi Ismaila, Shewa Adda, Swabi. Cricket is the main sport played in Pakhtunkhwa. It has created world-class sportsmen like Younus Khan and Umar Gul. Besides producing cricket players, Pakhtunkhwa has the honour of being the birthplace of many world-class squash players, including greats like Jansher Khan and Jahangir Khan. The following is a list of notable people who were either born in or are otherwise closely associated with or from the province of Khyber Pakhtunkhwa, Pakistan. Those born in Khyber Pakhtunkhwa have their names printed in bold. ^ Harrison, Selig S. "Pakistan: The State of the Union". Center for International Policy. pp. 13–14. Retrieved 24 January 2014. ^ Singh, Vipul (2008). The Pearson Indian History Manual for the UPSC Civil Services Preliminary Examination. Pearson. p. 65. ^ The Dust of Empire: The Race for Mastery in the Asian Heartland, Karl E. Meyer. Books.google.co.in. Retrieved 2013-11-20. ^ "PAKISTAN-AFGHANISTAN RELATIONS IN THE POST-9/11 ERA, October 2006, Frédéric Grare" (PDF). Retrieved 2013-11-20. ^ "Anti-Pakhtunkhwa protest claims 7 lives in Abbottabad". The Statesmen. 13 April 2011. Retrieved 8 May 2011. ^ "Khyber Pakhtunkhwa (province, Pakistan) :: Geography – Britannica Online Encyclopedia". Britannica.com. Retrieved 2010-05-25. ^ "It’s wintertime in Khyber Pakhtunkhwa | Newspaper". Dawn.Com. 2012-11-29. Retrieved 2013-05-24. ^ "Cold weather in upper areas & dry weather observed in almost all parts of the country | PaperPK News about Pakistan". Paperpkads.com. 2013-01-29. Retrieved 2013-05-24. ^ "North-West Frontier Province – Imperial Gazetteer of India, v. 19, p. 147". Dsal.uchicago.edu. Retrieved 2010-05-25. ^ "World Climate Data: Dir, Pakistan". Weatherbase. 2010. Retrieved 1 September. ^ a b See Wernsted, Frederick L.; World Climatic Data; published 1972 by Climatic Data Press; 522 pp. 31 cm. ^ "World Climate Data: Dera Ismail Khan, Pakistan". Weatherbase. 2010. Retrieved 1 September. ^ "Pakistani TV delves into lives of Afghan refugees". United Nations High Commissioner for Refugees. 2008-04-30. Retrieved 2010-05-25. ^ "UNHCR country operations profile – Pakistan". United Nations High Commissioner for Refugees. Retrieved 2012-12-12. ^ "District wise area and population of Khyber Pakhtunkhwa". ^ Wajihaalikhan1 (2011-02-15). "Pushto Muzakarah with Khiyal Jaan – پشتو مذاكرہ Islam Ahmadiyya". YouTube. Retrieved 2012-12-12. ^ "Jihad of Holy Prophet (Pushto) Discussion about Jihad پشتو مذاكرہ ۔ جہاد". YouTube. 2011-01-15. Retrieved 2012-12-12. ^ "Pakistan Valmiki Sabha". Bhagwanvalmiki.com. Retrieved 2012-12-12. ^ "Sikh refugees demand Indian citizenship". Oneindia News. 2010-02-24. Retrieved 2012-12-12. ^ "The Constitution". Government of Pakistan. Retrieved 2010-04-27. ^ "Provincial Accounts of Pakistan: Methodology and Estimates 1973–2000" (PDF). Retrieved 2010-05-25. ^ Roman, David (2009-05-15). "Pakistan's Taliban Fight Threatens Key Economic Zone - WSJ.com". Online.wsj.com. Retrieved 2010-05-25. ^ "Pakistan May Need Extra Bailouts as War Hits Economy (Update2)". Bloomberg.com. 2009-06-15. Retrieved 2010-05-25. ^ "Pakistan Balochistan Economic Report From Periphery to Core" (PDF). Retrieved 2010-05-25. ^ "World Bank Pakistan Growth and Export Competitiveness" (PDF). Retrieved 2010-05-25. ^ "Protest in Hazara continues over renaming of NWFP to Khyber Pakhtunkhwa". App.com.pk. Retrieved 2010-05-25. ^ "NWFP officially renamed as Pakhtun HAZARA". ^ "MMA govt proposes new name for Khyber Pakhtunkhwa (then NWFP)". Dawn. ^ Abbas, Hassan. "Peace in FATA: ANP Can Be Counted On." Statesman (Pakistan) (2007 Feb 4). ^ PBS Frontline: Pakistan: Karachi's Invisible Enemy City potent refuge for Taliban fighters. July 17, 2009. ^ "Pakistan's 'Gandhi' party takes on Taliban, Al Qaeda". CSMonitor.com. 2008-05-05. Retrieved 2010-05-25. ^ "Pakistan: where and who are the world's illiterates? ; Background paper for the Education for all global monitoring report 2006: literacy for life; 2005" (PDF). Retrieved 2010-05-25. ^ "Population Census Organization, Government of Pakistan". Statpak.gov.pk. Retrieved 2010-05-25. ^ "City University". City University. Retrieved 2013-05-24.